Successfully Added K1 Fitness Tracker Bracelet - Pedometer, Sleep Monitor, Heart Rate, Distance Tracker, Calorie Counter, IP68, APP (Blue) to your Shopping Cart. Steadily increase your daily activity levels with the K1 smart fitness tracker bracelet. This smart fitness gadget treats you to all the basic features needed to increase your stamina. It comes with a pedometer that keeps accurate track of the number of steps you take throughout the day. Your sports watch furthermore counts the calories that you have burned and the distance you have covered. By allowing you to set a daily activity goal, it keeps you motivated to keep moving. To further increase your overall user experience, it treats you to a sedentary reminder, stopwatch, and alarm clock feature. All the data can be read instantly of the watch’s crisp 0.66-Inch OLED display that features adjustable brightness. 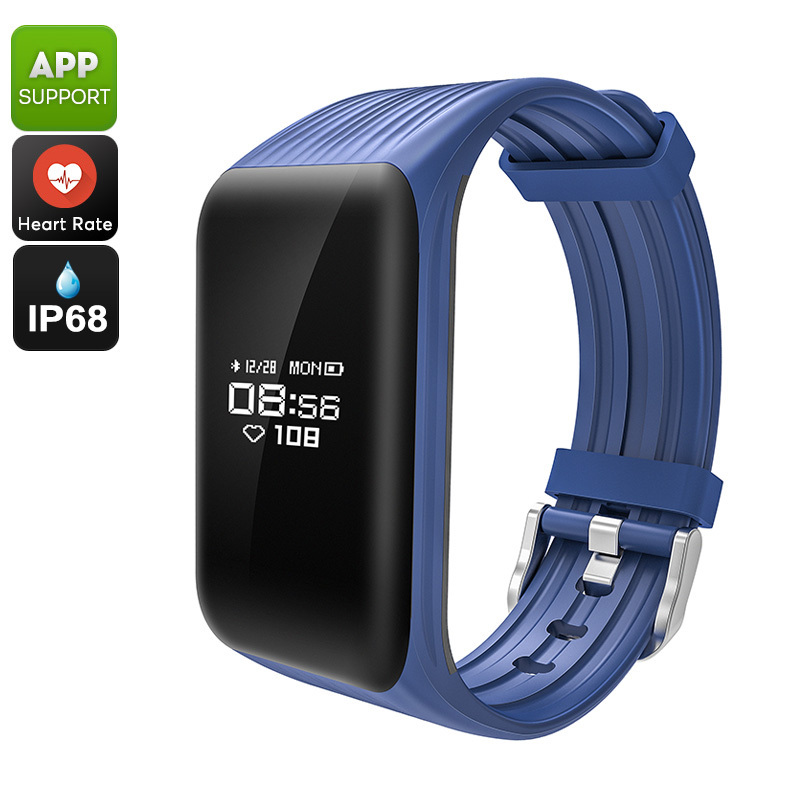 Thanks to its IP68 waterproof design, the K1 smart fitness tracker bracelet can be used in any weather condition. Via Bluetooth 4.0, it can be synchronized smoothly with your iOS or Android smartphone. When using it along with the dedicated mobile application, the fitness tracker treats lets you efficiently keep track of your exercise data. This makes it easy to analyze your progress and helps you to stay motivated along the way. Your sports watch furthermore treats you to call and message reminders. Therefore, you’ll never have to worry about missing out on an important update again while you’re out for a run. With its 105mAh battery, it treats you to a whopping 200 hours of usage time on a single charge. This smart bracelet comes with a 12 months warranty, brought to you by the leader in electronic devices as well as wholesale electronic gadgets..
Arabic: - مشاهدة الرياضة بلوتوث - Chinese Simplified: - 蓝牙运动手表 - Czech: - Sportovní hodinky Bluetooth - Dutch: - Bluetooth sporthorloge - French: - Montre de sport Bluetooth - German: - Bluetooth-Sportuhr - Hebrew: - שעון ספורט Bluetooth - Hindi: - ब्लूटूथ खेल घड़ी - Hungarian: - Bluetooth sportóra - Italian: - Orologio Sport Bluetooth - Japanese: - Bluetooth スポーツ時計 - Korean: - 블루투스 스포츠 시계 - Malay: - Menonton sukan Bluetooth - Norwegian Bokmål: - Bluetooth Sports Watch - Romanian: - Bluetooth sport Watch - Russian: - Bluetooth спортивные часы - Spanish: - Reloj deportivo de Bluetooth - Thai: - นาฬิกากีฬาบลูทูธ - Turkish: - Bluetooth sporcu seyretmek - Vietnamese: - Bluetooth thể thao Watch.